Editorial Board at kleef&co. Published by the UNDP. Some 1013-days ago the British people voted to Leave the European Union, and 990-days ago Theresa May became Prime Minister of the UK with a promise to deliver Brexit for the British people. Pretty straightforward, so far. Right? Ahem, yes, well; “That was then, and this is now,” you say. Almost 3-years on from the UK referendum to Leave the EU; The UK is in turmoil, another UK civil war isn’t out of the question, British MP’s couldn’t be more divided, the recent series of indicative votes in the House of Commons was interesting, informative, but ultimately inconclusive, and EU leaders are making statements like, “I didn’t know I had this much patience,” and “There is a special place in Hell for those who promoted Brexit without even a sketch of a plan of how to carry it safely,” which is a polite way for continental European leaders to say that the UK side hasn’t got its act together. Yet, whatever the plan is, it is inching along — about half as fast as it needs to — but at least something is happening. And, sometimes plans evolve. Which is what I think we’re seeing. An EU Withdrawal Agreement / Political Declaration / Joint Instrument has been approved by EU and EC Presidents (but not ratified by any EU27 Parliament) and by UK Prime Minister Theresa May (but not ratified by the UK Parliament) and it has been rejected by British MP’s three times in a row due to the 185-page Irish backstop clause. And no matter how many times Prime Minister Theresa May presents her WA/PD/JI to British MP’s it will fail. There is no chance of it ever passing as it means giving up any chance for the UK to write its own trade deals forever… or for as long as the EU remains an entity. And, yes, the people presently running the EU are very nice people. But as history teaches us, nothing lasts forever. So, who in their right mind would give up some amount of UK sovereignty (the ability to write free trade deals) to a foreign power and an economic competitor foreign power at that? SHEER LUNACY! Anyone who thinks this is a good idea is insane. Or, they hate the UK and want it to fail. Another offer on the table from the EU is either a Norway-style (EFTA) deal (but that means allowing unrestricted immigration from EU27 countries) or a Canada-style free trade deal (CETA) which is a highly regarded international trade deal between Canada and the EU27. The only problem, is that Canada loves the deal and quickly ratified it, while the EU 27 countries haven’t ratified it and are cherry picking which parts of the CETA deal they want to be bound by. Not a promising model for the UK to follow! Perhaps an EFTA deal with a no-immigration clause might work, or a CETA-style deal that both the UK and the EU27 are obligated to ratify within 90-days or automatic cancellation occurs. Either of those choices might represent an acceptable compromise. But choosing a pure EFTA deal where the UK gives up its sovereign rights to control immigration to a foreign power that is also an economic competitor, is a non-starter. SERIOUSLY! No country would consider such an agreement (prior to the so-called ‘Arab Spring’ / Syrian civil war the leaders of Norway couldn’t have foreseen millions of Middle Eastern refugees streaming into Northern Europe) but since 2010, anyone who thinks open borders is a good idea is insane. Or, they hate the UK and want it to fail. The ‘elephant in the room’ has a bad reputation, but only because of the groupthink mindset in the UK Parliament. Three years ago, one person(!) said that a WTO-style Brexit would cause irreparable harm to the economy and everyone in Europe has accepted it as unquestioned fact and have been repeating it verbatim since. Yet, all those Project Fear stories that had boffins hiding under their beds failed to materialize, and there’s every indication that the economic uncertainty provided by the past (almost) 3-years of dithering has caused far more harm to the European economy than an early WTO-style Brexit could ever have done. Really people, study this stuff! It’s important! A WTO-style Brexit, done properly, could save everyone from themselves, which is what’s needed at this time. Everyone, on all sides, are so dug-in to their positions that the only possible way out of all this groupthink is a novel approach. And this is the approach I will discuss below. The first thing we must acknowledge is that any WTO Brexit must work for both sides; There is no point at all in the UK trying to gain the upper hand, nor is there any point in the EU trying to out-negotiate Britain in a WTO-style Brexit scenario. a) A WTO-style Brexit must work for both sides. The second important thing is to choose an early date for the WTO Brexit, as every business and citizen in Europe have had ENOUGH @#$%# UNCERTAINTY! b) Choose a firm WTO-style Brexit date that falls before May 22, 2019 to miss the EU Parliament election cycle. Get your Sherpas to prioritize items to be negotiated in advance. Obviously, some parts of the UK-EU relationship are more important than others. Therefore, aircraft landing rights (for example) in each other’s countries would be more urgent for their respective economies than whether foods are marked as GMO or non-GMO — and yes, that’s important too, but not as important as keeping passenger aircraft fleets flying. i) On Day-1 of a WTO-style Brexit, let’s say that both sides agree to keep the existing civil aviation agreements in place for 90-days, but that any new rules would be added to the agreement and automatically kick-in on 90-days+1. Easy! ii) If shipping (both passenger ferries and freight shipments) are the #2 priority (let’s pretend they are) then on Day-2 of the WTO-style Brexit, both sides negotiate a new agreement, but for 90-days the existing rules and regulations continue to apply. So, 92-days later the new regulations (whatever they may be) automatically apply and are thenceforth implemented by both sides. Done! iii) Now let’s say that Chunnel rail traffic regulations need to be reapproved, or need changes to the existing ruleset. Both sides could agree to keep the existing regs for 90-days+3. So, whatever those new Chunnel rules and regulations are, 93-days from the official WTO-Brexit Day the new regulatory environment goes into full and automatic effect. Couldn’t be easier! iv) We’re on Day-4 of the negotiations and we know that in 94-days new food production regulations will kick-in, but for the first 90-days they will remain exactly as they are now. Whatever those new regulations are, food producers will have 90-days to adapt to the new regulatory regime (ostensibly to apply to the next growing season) and those new rules will automatically apply beyond 94-days from the official WTO-Brexit Day. Farmers and Ranchers will thank you for the advance notification! v) On Day-5 of negotiations, an Auto Pact (that’s a term used in North America, but call it whatever you want) could be arranged. And again, no changes to the existing agreements on vehicle trade between the UK and the EU for the first 90-days. But on Day-95 of the official WTO-Brexit date the new rules, regulations and standards would automatically apply and all European car manufacturers would need to comply with the new legislation. CEO’s from every manufacturer in Europe should be invited NOW to comment on what changes they’d like to see in the future trading relationship. BTW, let’s harmonize our financial incentives for new electric vehicle charging stations, for one, and harmonize our financial incentives to potential hybrid-electric vehicle purchasers, for two. Just two tiny examples of how the UK and the EU should be working together every single day of the year. So easy! vi) Immigration is an important item (but not as important as international trade!) but by Day-6 of a WTO-style Brexit, immigration would by then rise to the top of the priority list. It’s so simple; Keep everything the same for 90-days and then on Day-96 of the WTO-Brexit the new immigration regime comes into force on both sides of the English Channel. How hard can it be? The UK wants full sovereign control over its immigration, as does the EU. And why not? That’s what real countries do. Obviously, EU people who live in the UK need a streamlined passport that they can order online in less than 5-minutes and pay a £100. fee. Likewise, UK people who live in the EU need a streamlined passport that they can order in 5-minutes and pay a €100. fee. All such expats would therefore have 90-days + 6-days to get ready and complete their 5-minute online application. Another so-called problem turned into a solution that makes politicians on both sides look brilliant! And all of it could be done on one super secure, mega-expat-website that both sides maintain. Expats on any continent never had it so good! How different would Europe have looked to the world if this particular problem-solving / opportunity-based approach had been instituted beginning January 2017? A full WTO-style Brexit would’ve been completed in 180-days. How many billions of Sterling and Euros that HAVE BEEN LOST due to the almost 3-years of economic uncertainty WOULDN’T HAVE BEEN LOST had the incremental WTO-style Brexit method been employed? Instead of making Brexit ‘part of the problem’ between European allies, UK and EU politicians should’ve been making Brexit ‘part of the solution’ towards a fairer, more secure, and more egalitarian Europe. A Europe that respects ‘the other’ — not only in word but in deed — and gives proper place to the reasonable, legitimate, and sovereign concerns of modern-day nation states on both sides of the English Channel will enjoy ever more respect in the global family of nations. Reach out to each other my European friends, for that ideal future is still within your grasp! In an historic referendum on June 23, 2016 a majority of British citizens voted to Leave the European Union, and the ruling Conservative Party of the United Kingdom agreed to carry out the will of The People. So far, so good. Theresa May was then appointed by the Conservative Party to be “The Brexit Prime Minister” and both the Conservative Party and the new Prime Minister promised that they would carry out the will of The People. To be fair, there are still 8-days to go until the official Brexit date of March 29, 2019 and the UK could still conceivably Leave the EU on time — thereby allowing Theresa May and her Conservative Party to keep their promise to The People. At least, that’s the theory. So, it’s important to note here that The People didn’t vote for a Withdrawal Agreement, nor did they vote for a Political Declaration, nor did they vote for a Joint Instrument. The People voted to Brexit, they didn’t vote for fancy-schmantzy political documents that seem unbelievably important to bureaucrats and politicians, but which appear to be meaningless drivel to the severely normal citizens of the UK and the EU. Therefore, the onus is on UK and EU politicians to get the job done that they were hired to do, and to not allow their political games (or their trouble-causing political documents) to prevent the will of The People from being carried out as directed in the easy to understand 2016 referendum ballot question and subsequent vote result. To put it simply; The will of The People trumps the bureaucratic and political machinations of UK and EU politicians, 100% of the time. Why Do We Need a Brexit Extension Anyway? Because. The. Politicians. Just. Couldn’t. Get. The. Job. Done. Is anyone really surprised about this? I doubt it. Today, with 8-days to go until the official Brexit date of March 29, 2019, the EU appears to have granted Theresa May’s request to extend the official Brexit date to May 22, 2019 (not to the June 30, 2019 that she was asking for) subsequent to the UK House of Commons passing the draft Withdrawal Agreement, and the non legally binding Political Declaration, and the (helpful in a minor way) Joint Instrument. So, what have they been doing over the past 1001-days? As of today’s date (March 21, 2019) it’s been 1001-days since Britons voted to Leave the European Union — and in all that time the politicians couldn’t come up with a way for the UK to Leave the EU and not have it break their own-chosen date of March 29, 2019. It’s a damning indictment of politics in the 21st-century. There’s no other way to say it! Let’s Compare Cultures, Shall We? In any military culture, a failure to deliver on such a massive scale would result in the court-martial of everyone involved in this duster-cluck; And in any corporate culture, every CEO involved would’ve been fired at the 6th-month for non-performance, and likewise their replacements fired at each subsequent 6th-month interval for the same reason. In any royal culture; Such Kings, Queens, Princes, etc., who would fail on such a massive scale would have their status severely downgraded among their peers within days or weeks. Let’s imagine for a moment that Theresa May, Jean-Claude Juncker and Donald Tusk were hired on June 23, 2016 by the Academy Awards talent committee to host the Academy Awards on March 29, 2019. And then, let’s imagine that they were still negotiating (with each other) the lines that they would read while on stage, right up to mere hours ahead of the Academy Awards event. And then let’s imagine that all three of them emailed the Academy Awards talent committee mere hours before the event to inform them that they wouldn’t be ready to read their lines on March 29, 2019 — until May 22, 2019, or maybe later than that. Consequently, the Academy Awards would need to be suddenly cancelled and rescheduled to May 22, 2019, or maybe later than that. Or, suitable replacements to host the Academy Awards would need to be found, to allow the show to go on as originally scheduled. What do you think the response from the Academy Awards talent committee would be? What do you think the response from the television viewing public would be? Only in political systems could humans exhibiting failure on such a massive scale survive and thrive. Having Painted Themselves Into a Corner; The Only Face-Saving Way Out of This Disaster is a WTO Brexit! Maybe that’s what these politicians wanted all along, as the end result! In that way (they hope) citizens on both sides would recoil in horror from the dreaded WTO-style Brexit. Which makes it suspicious that these politicians and their friends have been doing everything they can and more to amp-up the fears surrounding a so-called ‘No Deal’ Brexit, which would allow these bad actors the political cover they need to cancel Brexit altogether. Which is, I suspect, what they wanted all along. London, UK: Prime Minister Theresa May’s Conservative government loses a historic vote in the UK House of Commons on her cherished (and reworked) Withdrawal Agreement by a vote of 391-242, a margin of 149 votes. History: On January 23, 2016 an historic vote was held where 52% of those Britons who cared to show up at the polls, voted to Leave the European Union. They didn’t vote for a complicated Withdrawal Agreement, nor did they vote for a high-sounding, but non-legally binding Political Declaration. Britons voted to Leave the EU. Nothing more, nothing less. They didn’t vote for a Withdrawal Agreement, nor did they vote for a Political Declaration. Subsequent to the EU referendum, the UK held a General Election in June of 2017 where all UK political parties as part of their party platform supported Brexit. Not one party ran on an anti-Brexit platform. And no surprise there, as each party was simply mirroring the will of The People since the June 2016 EU referendum. Since that time, Prime Minister Theresa May and EU negotiators have been attempting to agree a deal for the UK to leave the European Union over-and-above the simple wishes of the UK electorate and that proposed deal has become known as the EU Withdrawal Agreement. That’s the deal that was voted down in the House of Commons in January 2019 by a historic margin of 230 votes. Never in British history had a bill been so resoundingly defeated. Now that same bill with minor changes has been voted down by British MP’s by a healthy 149 votes. I suspect that much of the failure of this latest iteration of the bill was because MP’s had only a few hours to study the reworked (and incredibly complex) Withdrawal Agreement, as Theresa May presented the new version less than one day before it was up for a Parliamentary vote. Très gauche, Theresa! Near-Term Parliamentary Process: Tomorrow (March 13, 2019) MP’s will vote on the so-called ‘No Deal’ scenario and on March 14th they will vote on whether the UK should go to the EU (cap in hand) to ask for an Article 50 extension — to give more time to UK and EU negotiators to come up with a deal — notwithstanding that 2.5 years hasn’t been long enough and notwithstanding that not one single issue will have changed in the meantime, and the EU is under no obligation whatsoever to accept an Article 50 extension. Let me repeat that statement; If an Article 50 extension is requested by the UK, the EU is under no obligation to accede to that request, nor will any issue have changed (nor the opinions behind them) in the meantime. Therefore, what exactly would be the point of the UK applying for, or the EU accepting, an Article 50 extension? See? There’s no logical reason to extend the Article 50 deadline. And from the point of view of UK voters, an Article 50 extension would reward mediocrity — the kind of mediocrity that is represented by 2.5 years of limp-wristed and on-again-off-again negotiating that doesn’t deserve another chance. What Would Margaret Thatcher Do? Anyone who saw how Margaret Thatcher operated would know that she wouldn’t have done the EU dance, allowing them to call the tune every step of the way. For tomorrow’s vote, Maggie would’ve simply whipped her MP’s to vote for a ‘No Deal’ Brexit — and that would be the end of the present 2.5 year-long period of economic uncertainty — and it by far would be the best thing for the UK economy and for Britons wondering where all this unguided or lightly guided Brexit will end-up. And that’s what Theresa May hasn’t yet learned. Margaret Thatcher, on the other hand, learned over her long career that no matter what promises have been made, no matter how uncomfortable the short-term might be, no matter the (short-term) howls of protest, senior politicians must stand up and do what’s best for the country, and do it with a sense of urgency and purpose. And what’s best for the UK at this moment in history is for Theresa May to ‘whip’ her MP’s tomorrow to support an automatic ‘No Deal’ Brexit and just get Brexit done and dusted — thereby putting a definite and permanent end to the present economic uncertainty. Her detractors will say, ‘Yes, but Theresa May is no Margaret Thatcher!’ and whatever else anyone ever said about her, Maggie commanded a high degree of respect from her political friends and enemies due to her having the courage to always and without fail do ‘the right thing’ as she saw it — no matter the obstacles. If Prime Minister Theresa May can summon her inner Margaret Thatcher tonight and direct her Parliamentary whips to force every Conservative MP to vote FOR a ‘No Deal’ Brexit tomorrow, all the uncertainty building in the UK economy would dissipate within a matter of days. And Britons and UK stakeholders could get on with the job of making Brexit Britain an astonishing success story and the EU could concentrate on its internal problems. Phew! It would be the defining moment of Theresa May’s premiership. The entire world would thank the Prime Minister and breathe a sigh of relief. Yes, even in Brussels! Small numbers of Remainers might complain for a few days, but on the whole, being decisive now would solve more problems than continuing along the present course. Can Theresa May (BPE) the Bureaucrat Par-Excellence make the switch to Theresa May (PPE) Politician Par-Excellence and be the politician that’s so desperately needed at this crucial moment in Britain’s history? STATEMENT: Being a British Prime Minister has got to be the least fun job on Earth. WHY? Because everyone wants you to fail! Opposition MP’s want the Prime Minister to fail (don’t take it personally) it has been thus since the beginning of time. Conservative Party members would each move-up one notch should the serving (Conservative) Prime Minister fail and subsequently lose her job. (Again, nothing personal. It’s the nature of politics) However, British politics can seem especially brutal. And lest we forget the EU which hates the idea of the UK leaving the union — and why wouldn’t they? — as the UK pays more into the EU than any other country, save Germany. Yet, only the UK pays (up to) £12.221 billion per year (net) to be a member of the EU club. 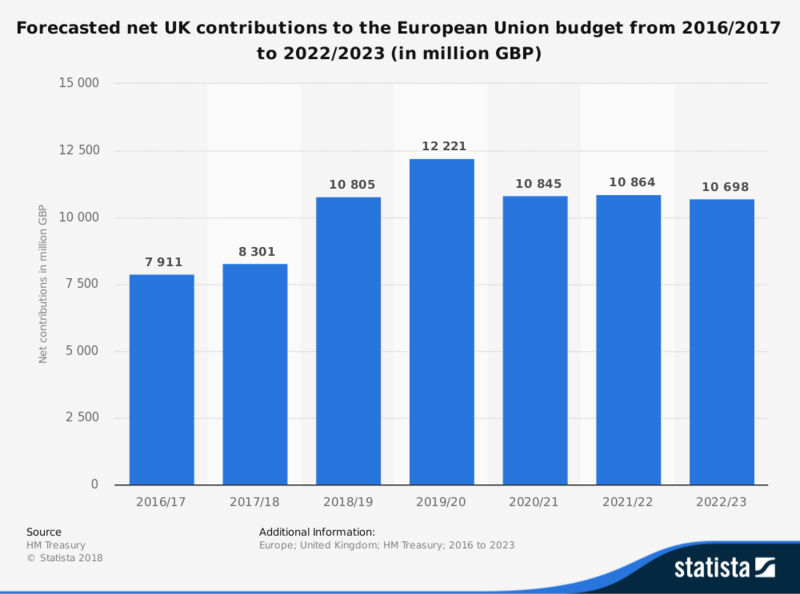 Which averages out to 10.235 billion (net) per year that British taxpayers pay to the European Union black hole they call their budget to allow the UK to remain in the European Union. Of course the EU hates the idea of Brexit, blames every British Prime Minister since Churchill for Brexit and even if it costs them a Remainer-or-Soft-Leaver europhile Prime Minister by the name of Theresa May, even they want the PM to fail. All of which gathered together causes one to wonder why anyone (anyone!) would want the job of British Prime Minister. You can’t win when everyone wants you to lose. Yet, she has stuck it out. Which gets her some respect around here. Too bad she’s a Remainer in Leavers clothing, otherwise she could keep the damn job forever IMHO, or until the next sado-masochist feels they require more beatings per hour than they presently receive. So as heartless as it sounds, she’s got to make good on her promises. And Promise #1 was to get Britons out of the European Union. There’s no wiggle room there. The People voted to Brexit. They didn’t vote for a Withdrawal Agreement nor did they vote for a Political Declaration — those things are contrivances by Theresa May and her EU pals. Britons voted to Leave the EU. Nobody cares about all that hoopla outside of those who work in the EU Parliament or in Whitehall. And that’s what politicians don’t get. Good intentions, bureaucratic excellence, and sadomasochism aside — get us our Brexit Theresa May and you can continue to receive as many beatings per hour as you want. You seem to thrive on it. Just like every previous British Prime Minister. Really, there’s only one choice. And if you make that clear enough to the EU side Theresa, they’ll see the situation clearly and act accordingly. If you don’t draw those distinctions clearly you’ll unwittingly set the seeds for the very result that you and the EU say you don’t want. So instead of endlessly repeating, “Let’s be clear” — BE CLARITY ITSELF! — and save yourself, your EU pals, and 500-million Europeans from an unnecessarily hard Brexit!